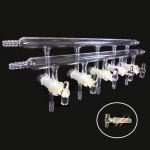 Borosilicate glass double bank vacuum manifold available in 3, 4 or 5 connection port configuration, with 2mm bore vacuum hollow glass/PTFE stopcock or adjustable 0-4mm bore size PTFE stopcock. Connection ports are spaced 100mm center to center. All connection ports have 10mm OD serrated hose connections. Main body tubes have one inlet/outlet hose connection on each end. Number of ports: 5. Glass Stopcocks. Stopcock bore size: 4mm. 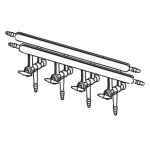 Overall length: 455mm.